Lately, I've seen a Yakisoba commercial on TV a few times. ..... Our family used to go to the beach often during our summer vacation when my sister and I were in grade school. In Japan, there are always some beach house by the ocean, it's called "Umi-No-Ie"( 海の家 ), they have a rest room, shower, changing room, souvenir shop, and cafe and restaurant. In the restaurant, they sell grilled squid or clam, curry and rice, saved ice, corn dog...etc., and there is always Yakisoba in the menu. I don't think I never missed a day when i would ask my parents to have Yakisoba. It's usually added with a little bit of cabbage, carrots, and onion, that's it. So nutritionally Yakisoba is not a great dish by itself to get a lot of nutrients. So, I added a lot of spinach, chard, carrots, and cabbage, almost same amount with noodle. I topped with dried shrimp, too. 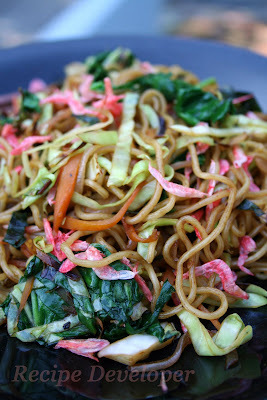 The great thing about yakisoba is that you can make it as healthy as you want just by adding lots of fresh vegetables.